Home SUCCESS Do you have the guts? 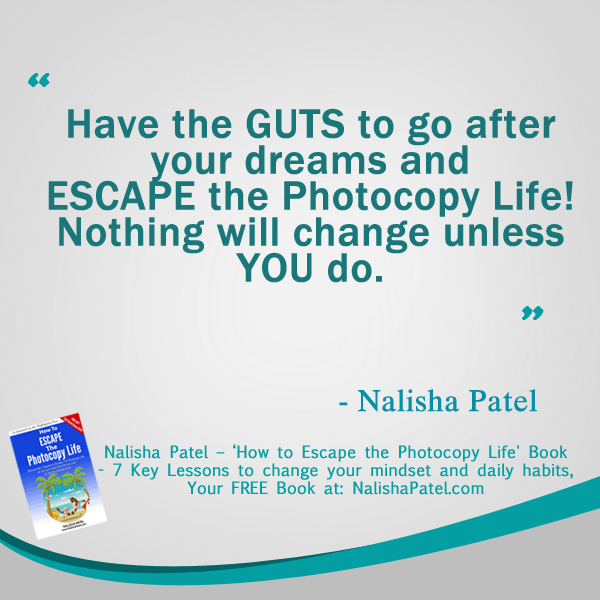 Do you have the guts to go after what you really want in life? Are you happy with where you are currently at in terms of your business and career? Are you happy with your current level of health? Are you happy with your day-to-day life? Are you happy with how you spend your time? Are you happy with how much money you have coming in? Sorry to be the bearer of bad news, but nothing is going to change until you change what you do DAILY. That is where the REAL POWER is to change your life. THINK about what it is you want in life and then NURTURE your personal philosophy so you actually do the right actions. Start defining what it is that you want in each major area of your life….and write it down in a dedicated notebook or folder. Audit your close circle of friends and family and limit or cut those that pull you down or mock your dreams. People that don’t respect your dreams or are non-supportive, will KILL your goals. Cut ’em and run! Move your TV into the basement, ditch your netflix’s subscription and vow to cut out all media (trash magazines, the news, gossip websites etc….for just for 1 week .Yes, I know, it’s going to feel hard at first. Trust me; your life will change if you are willing to try this! Every morning, take 10 minutes to think about your key goals and to map out your day’s key tasks. Ensure your schedule includes tasks that take you closer to your goals. Exercise! Yep, as a health and fitness adviser, I had to recommend this one 🙂 Make the time to do some exercise each day, be that weights, pilates, walking, jumping on a cross-trainer, or any other activity that gets your blood pumping. Choose to focus on what you want in this life, and soon you will shape your personal philosophy so that you naturally have the GUTS to go after everything that you desire! P.S Need a bit of help refining your personal philosophy, and need a boost to create a better mindset? Previous articleHow many weeks have you got left to live?